New tax documents reveal that Islamic Relief USA (IR-USA), the largest Islamic charity in the United States, gave over $118,000 in grants in 2013 to entities with previous connections to terrorism. IR-USA’s 2013 tax return, which was filed in July 2014, showed that the charity gave $45,495 in grants to the Florida branch of the Council on American-Islamic Relations (CAIR). CAIR was listed as an unindicted co-conspirator in the successful 2007 prosecution of the Holy Land Foundation for financing the terrorist organization Hamas. Their form 990 also shows that IR-USA gave $40,000 to the radical mosque Dar Al-Hijrah in Falls Church, Virginia, for a “zakat partner program.” Deceased terrorist Anwar al-Awlaki served as the mosque’s imam leading up to and immediately following the 9/11 attacks. The tax schedule also documented almost $32,909 in grants to Services for Human Advancement and Resource Enhancement (SHARE) affiliates in Atlanta and Indianapolis of the Muslim Alliance of North America (MANA), a group which was founded by an unindicted co-conspirator of the 1993 World Trade Center bombing. IR-USA has been involved in several scandals in recent years: Money Jihad previously reported that IR-USA gives about $5 to $10 million per year to its parent charity Islamic Relief Worldwide (IRW), which has recently been banned from Israel for funding Hamas. IR-USA was also implicated in fraudulent multi-million dollar valuations of its drug stockpiles. More recently, Islamic Relief affiliates have described their own partnerships with the pro-Hamas front charity IHH to conduct operations in rebel-controlled territory in Syria. 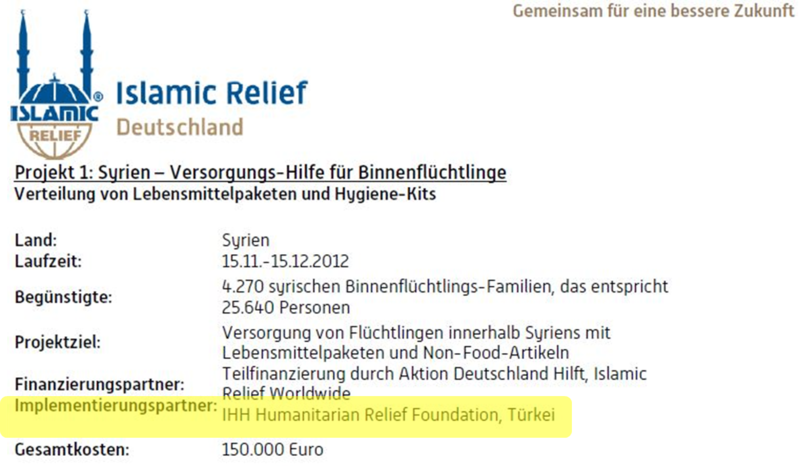 Islamic Relief Deutschland, the German chapter of Islamic Relief Worldwide (IRW), listed the Islamic front charity IHH as an “implementation partner” for a €150,000 aid project within Syria in a 2013 press release, raising serious questions about IR-Deutschland’s willingness or competence to vet partner charities abroad. The partnership is striking considering that the German interior ministry previously banned IHH from operating in Germany because it had contributed money to Hamas. A German federal court upheld that ban in 2012 although an agreement was later reach that allowed IHH to operate under certain conditions. IHH instigated the violent, blockade-running, anti-Israeli Mavi Marmara flotilla in 2010, and it has worked in concert with the terrorist group al-Shabaab in Somalia. IHH’s accounts in the Netherlands were frozen by Dutch authorities in 2011. IHH was reported to have smuggled weapons to the Syrian Muslim Brotherhood as early as 2012. IRW itself has been banned from Israel because of its support for Hamas. The behaviors of IRW’s German affiliate may help to explain why Israel regards IRW as a threat. Meanwhile, Al Qaeda has capitalized on the flow of international aid of all kinds to Syrian fighters. That aid includes significant support from Turkey, which has provided ongoing assistance to militants fighting Bashar al-Assad in Syria, and has allowed fighters to cross its border with Iraq to join ISIS. Western charities have a responsibility to carefully examine any partner charities in Turkey, Iraq, or Syria prior to sharing money and supplies with them, but this German revelation casts further doubt on the thoroughness of the due diligence conducted for these international relief efforts. Islamic Relief USA, the American affiliate of IRW, has conducted several humanitarian relief operations in Syria over the last few years. From December 2012 to May 2013, IR-USA conducted a project which, according to their own website, “provided emergency aid to Syrians in need inside of Syria through Islamic Relief partner offices in Turkey” (emphasis mine). The national affiliation of those “partner offices” in Turkey is unclear since Turkey does not appear to have its own, permanent Islamic Relief chapter. Germany’s sizable Turkish immigrant community gives IR-Deutschland better connections and access than most international Islamic charities to the Turkish border. As if things weren’t bad enough in Somalia, Saudi Arabia and Qatar have funded an increasingly active death squad that has embedded itself within Somalia’s security forces, according to a new investigative report from Waagacusub, a Somali news service. The report also says that Saudi Arabia and Qatar are behind a decision for Somalia to “discontinue” its long-fought war against the terrorist organization al-Shabaab. By way of background, Somalia modified its internal law enforcement and domestic surveillance service in January of last year and rebranded it as the National Intelligence and Security Agency (NISA). NISA has since been compromised. Separate from NISA is an entity known as Dam Jadid, the ruling Islamic political party of Somalia. Different ministers of the government represent different factions of Dam Jadid, with some ministers being more fundamentalist than others. One freelance reporter contacted by Money Jihad described Dam Jadid simply as an offshoot of Al-Islah (Somalia’s Muslim Brotherhood). Dam Jadid has close ties to Arab states. Shabelle Media noted last year that “recently named ambassadors [from Somalia] to the Arab countries all hail from Dam Jadid.” Ahmed M. Yassin, A Somali living in Toronto, told Money Jihad that Dam Jadid is funded by Qatar, Saudi Arabia, and the U.A.E. Waagacusub has revealed that Dam Jadid operates its own blackshirt security and intelligence squad known as “Ruhanta,” meaning “ghosts” or spirits. Ruhanta is allegedly behind a host of political assassinations and the recent slaying of three Syrian physicians in Somalia. Saudi Arabia and Qatar have previously and in many ways still continue to back al-Shabaab directly. Perhaps the shift in resources toward Ruhanta and the fifth columnists within NISA is a Gulf-based attempt to take over the government of Somalia from within, rather than through costly military operations carried out by Shabaab fighters. The Gulf’s funding of Ruhanta and NISA infiltration in the war-torn country amounts to kicking a man when he’s down. The exploitation of Somalia by Gulf powers resembles how Pakistan has for decades coveted Afghanistan as its private playground, and has employed and deployed jihadists there to gain a strategic advantage in the region. The sermon was originally written in Arabic by Sheikh Mohamad Abou Eid, the mosque’s imam, and Brother Baha presented an English translation to the congregation. The central message was that you should “sell” or give your life and wealth fighting for Islam, and your payment in return from Allah is paradise. This “trade with Allah” is the best trade—-better than selling vegetables or other mundane commodities—and it is the type of trade that will spare you from hellfire. The sermon (of which 10 minutes of audio is available here) included the story of a boy in the early days of Islam who supposedly shot three arrows at opposing “Roman” forces before himself being “martyred.” Brother Baha told his listeners that both the boy and his mother (who applauded her son’s martyrdom) had both engaged in the best kind of trade with Allah. The sermon represents mainstream thought and tradition in Islamic law which offers great rewards for jihadists and those who fund them, such as Koran 8:60 and 9:41. Preston Masjid is an important mosque led for 30 years by Sheik Fehmi Naji El-Imam, the current “Mufti of Australia.” The Preston Muslim community was also responsible for getting the Darebin council to hire a Muslim missionary with taxpayer dollars. A tax lien has been filed against the Atlanta Masjid of Al-Islam, the self-proclaimed “largest and oldest Islamic community in Metro Atlanta.” The owners of the mosque must pay about $6,000 to satisfy the lien and prevent the property from being sold on the courthouse steps of DeKalb County on Apr. 3. 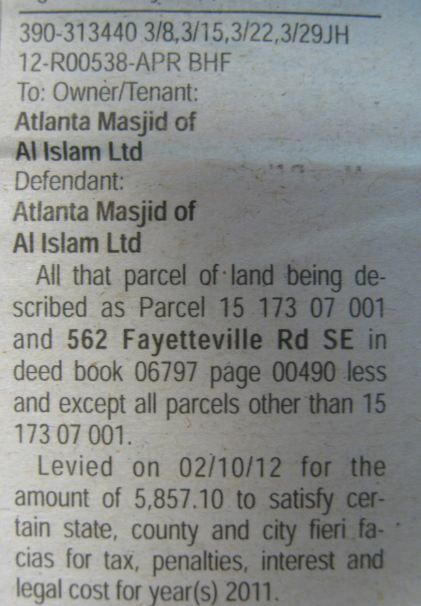 The Atlanta Masjid normally pays about $10,000 in local property taxes a year for its property on 562 Fayetteville Road, but has only made a partial payment for 2011. The mosque also owes smaller amounts on adjoining property it owns at 560 and 596 Fayetteville Road. Details of Atlanta Masjid’s finances are not available to the public because the organization has no tax form 990 on file with the Internal Revenue Service. Its website seeks zakat donations for the mosque, for Eid, and for the schools operated by the mosque. The mosque has a “Majlis Ash-Shura Board” which appears to have marginal oversight over funding, but it does not appear to have a dedicated finance committee. Daaiyah Shakir is listed as the mosque’s treasurer. Atlanta Masjid caught the attention of Atlas Shrugs in 2008 for a potential violation of 501(c)(3) tax law by hosting a political event for Barack Obama onsite. Despite its tax problems, the mainstream media is content to present only a positive image for Atlanta Masjid. CNN has reported warmly on the mosque before, calling one of its Ramadan iftars “splendid,” and touting the mosque’s “community outreach.” The Atlanta Journal-Constitution assured readers that Atlanta Masjid is “egalitarian, mainstream” (while showing a photo of male-only worship) during the mosque’s alleged 50th anniversary. Money Jihad has been contacted by a consumer who says his bank information was compromised, and that $1,300 was transferred out of his account to the Illinois-based Zakat Foundation without his consent in the wake of the Jan. 15 Zappos security breach. Our tipster says that the Zakat Foundation has finally “refunded” his $1,300 after a lengthy slog, but he was still concerned about how many other people may have been affected and for what purpose the transactions were made. Money Jihad is unable to verify the allegation against the Zakat Foundation independently, but details provided privately by the consumer about his experience are consistent with aspects of the Zakat Foundation that are unknown to the general public. The Zakat Foundation is one of the nation’s five largest Islamic charities. Its tax filings with the IRS indicate that its largest program expenditures overseas are in sub-Saharan Africa, where the Zakat Foundation says it is actively involved in relief camps, food distribution, and digging wells in the Horn of Africa. Previously, Money Jihad has documented the Zakat Foundation’s cooperation with the British-based Muslim Hands, an organization identified by Israel as a member of the Union of Good network of charities that supports Hamas. The U.S. Treasury Department has designated the Union of Good as a Hamas-funding entity. If you have been a victim of online fraud that has resulted in an unauthorized payment to the Zakat Foundation or to any other entity, you should pursue an immediate refund through your credit card company or bank. Charities are regulated by states, so you should also promptly file a complaint with your state’s charitable regulator (which in the case of the Zakat Foundation is the Illinois attorney general). Alerting law enforcement may be necessary depending on the circumstances. In this modern Internet era, you should also go public with your complaint so that fellow web users are aware of which entities are benefiting from online security breaches. Get the word out and spare other citizens the heartache! If a food manufacturer wants to call its products halal, and obtain a label that attests to its halal compliance, that manufacturer must submit an application for review by a halal certification organization. In the U.S., halal certifiers are not government entities and, unlike organic food certifiers, are not accredited by the government. The halal boards are privately run. One of the largest halal groups is the Islamic Food and Nutrition Council of America (IFANCA), a Chicago-based multi-million dollar enterprise. But as Family Security Matters has noted, “There are very few transparent news reports of the expansion” of the halal industry in North America. The time has come for fuller scrutiny. First, IFANCA proclaims on its own website that it is recognized and endorsed by the Saudi-based, Wahhabi hegemon Muslim World League. The MWL has funded Al Qaeda, Hamas, and other terrorist organizations throughout the world in an effort over several decades to export and ingrain Wahhabism across the planet. But this doesn’t seem to bother IFANCA. Second, IFANCA claimed tax-exempt status in its 2010 tax return even though the vast majority of its reported revenues comes from “inspection fees.” These are fees that IFANCA charges to food producers for the “privilege” of sporting IFANCA’s halal food logo. Such fees sound a lot more like ordinary business income that should be taxable rather than charitable or “public” contributions which would qualify the entity for tax-exempt status. IFANCA’s Form 990 showed $5,519,829 in inspection fee revenue. Its only other reported revenues were $14,466 in gifts. IFANCA casts itself as an educational entity of sorts, promoting “knowledge” and “community development” with respect to halal foods. But it does not base its claim for public charity status on its educational or religious mission, but rather by describing the inspection fees as public contributions. IFANCA’s tax approach makes it relatively unique among food certification groups such as organic, vegan, and kosher certifying entities. Several U.S. organic food certifiers are tax exempt on the bases of Section 501(c)(5) of the Internal Revenue Code because they have an agricultural mission—not on the basis of any professed public charity mission under 501(c)3. The Vegan Awareness Foundation, which is a major certifying entity for vegan foods, maintains tax-exempt status on the basis that it receives a substantial portion of its revenues from donations or grants—not from site inspections. Many kosher certifying entities are set up as regular businesses and pay taxes. The IFANCA case illustrates a flawed federal system that accepts 99 percent of all claims for tax-exempt status. The IRS can start making amends by revoking IFACNA’s tax-exempt status. Moreover, due to its tax-dodging behavior and World Muslim League affiliation, consumers should avoid buying any IFACNA-certified foods, and grocers should refrain from stocking their shelves with such products. You are currently browsing the archives for the Original reporting category.